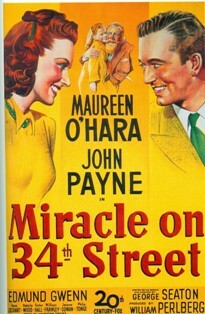 Miracle on 34th Street has been a classic in America since 1947. Strangely this film was not released to capitalize on its Christmas themes. 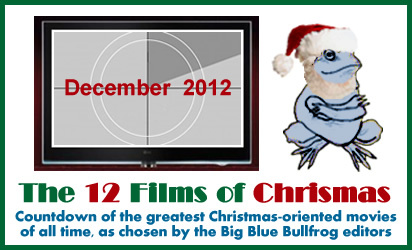 Instead it was released in June and the Christmas aspects of the film were downplayed in the advertising of the film. Hard to believe that this Christmas classic did not have ad men behind it promoting it as a Christmas film. That said I like the idea that the film makers behind this movie felt that it was good enough to stand on its own without Christmas making it into a hit. Of course the film did eventually become unspeakably tied to the holiday and now we see it on ever year after Thanksgiving. So what keeps this holiday classic in our hearts year after year? Well for one thing it is completely self aware. The fact that Gimbels and Macy’s play so heavily into the plot is not lost as the film deals with consumerism in the holiday season. A level headed serious woman named Doris Walker (played by Maureen O’hara) who hires a department store Santa named Kris Kringle (played by Edmund Gwenn) who actually believes he is Santa Claus. The film’s plot revolves around Kringle trying to instill a child like wonder in Walker’s daughter Susan (played by Natalie Wood) while the kind gentleman Frederick Gailey (played by John Payne) attempts to become romantically involved with Doris. The climax of the film involves a court case to prove Kringle’s sanity which eventually becomes a court case to decide whether or not Santa Claus exists. The film is fantastic in its illustration of how much things haven’t changed involving Christmas since 1947 and how much they have. Perhaps the best part of the film involves it’s ending which leaves open whether Kris Kringle was in fact Santa Claus or just an extremely nice man who believed he was Santa Claus. It’s truly timeless and I personally enjoy the fact that the bad guy is a department story psychologist who never got an actual degree. This film really touches on Christmas in America while staying funny after decades of existence.